So, I've been messing around with a little porta studio I picked up and wanted something more than the built in mic's that come with it. Since I have a bit of OCD about certain things, I figure I'd give the Audix Cab Grabber a try. Seems like it would be a great item for playing out. 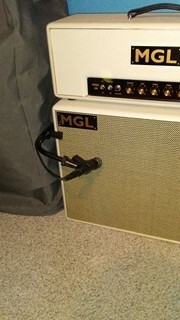 No additional mic stands to trip over, it has two clips to run the wiring back behind the cab. Simple to install as it is spring loaded (like the reverse of a child's gate) so you just stretch it out, slip it over the edge or the top of the cab and set the angle of the arm to position the mic. Has two large knurled nuts to adjust the angle of the arm and the rotation of the mic clip. Seems well built, easy to install, etc. 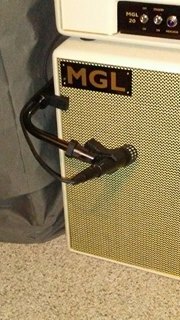 Makes me wish this was around back in the day when I used to road crew.....would be slick to speed up clearing an opening band off the stage as you could just roll the whole amp/stack/cab/mic/etc off in one move and then tear it down off stage. Also have to give a shout out to the Audix i5 mic. Since I'm just dabbling with recording, I didn't want to spend a fortune on a mic. I figured I'd hit my local shop and try to find a good used SM57 as I'm familiar with them from back in the day. My shop didn't have any, so a guy I trust there recommended the i5.......it was only $40 used, so I gave it a shot. Very happy with the sound out of it. Wouldn't hesitate to use them live or studio. Check out my Facebook page "NHTom's Guitar and Music"
Always looking for BEDROCK amps, cabinets, and merchandise....let me know what you have!